With a TiVo® PVR, you can stream live TV or recordings in standard definition (SD) or high definition (HD) directly to your iOS or Android device, at no extra cost. You can also download recorded shows from your PVR to your mobile device, and take them with you on the go. You can download the Cogeco TiVo® App from the App Store, Google Play or the Amazon Appstore. You can install the app on multiple devices. Sign in to the Cogeco TiVo® App with your Cogeco My Account username and password. If you haven’t yet created a My Account profile, you can do so by going to the My Account login page, then selecting New user? Create a My Account profile. Once you’ve selected the device you want to use, you’ll automatically have access to all the TiVo® features compatible with your TiVo® PVR. Sign in to the Cogeco TiVo® App. Select a recording and then tap Download. The app now lets you choose if you want to keep a copy of your recording on your TiVo® PVR, or download it to your phone instead. Keep in mind that if you download a show or movie to your mobile device, it will automatically be deleted from your TiVo® PVR. All mobile devices must be on the same home network in order to download content from a TiVo® PVR. Some channels block the download of shows to mobile devices because of their copy-protection requirements. In other cases, you are only entitled to have one copy of the recording. TiVo® 4K PVR recordings are not available for download or streaming on mobile devices. Video On Demand programs cannot be recorded or downloaded. Recordings you’ve downloaded are listed within the On Phone (or On Tablet) tab. Streaming content when paired to a TiVo® PVR is limited to 2 simultaneous viewings while at home, and to one streaming session while away from home. 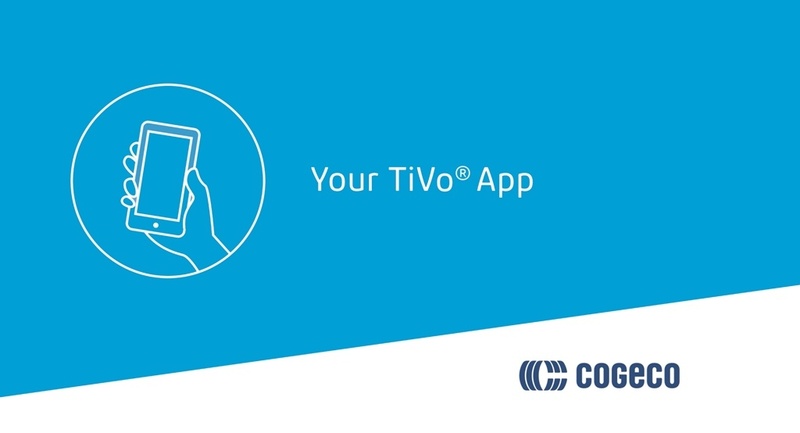 Rest assured that using the Cogeco TiVo® App to stream live TV, play recordings or download recordings from your TiVo® PVR to your mobile device will not affect your monthly Internet usage.